The sequence in question starts at 2:59. Viktor says Marvel Studios first contacted her in 2016, and then again earlier this year, about the possibility of either using works from her Constellations series—which feature “stylized motifs of mythical animals, gilded geometric forms on a black background, and distinctively textured areas and patterns, arrayed in a grid-like arrangement of forms”—for Black Panther’s set, or possibly commissioning her to make a new work to promote the film. Viktor ultimately declined, which, she says, explains why she was shocked when friends began forwarding her the video for Lamar and SZA’s song, asking if she’d ended up working on the project. 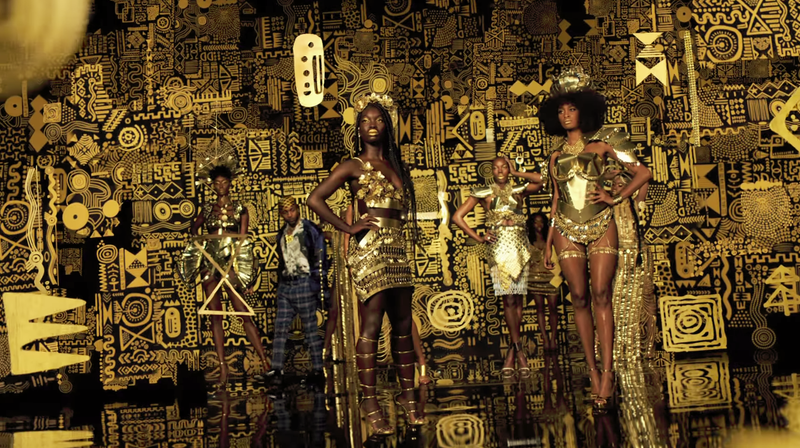 The Infringing Video and the Movie promotes (and profits from) themes of black and female empowerment and the end of racist and gender exploitation, themes particularly topical in the current environment. Yet, in a bitter irony, the Defendants have ignored the wishes of the Artist, herself a Black African woman, whose life’s work is founded on an examination of the political and historical preconceptions of “blackness” liberation and womanhood. In contrast to his message in the song’s lyrics that “I hate people that feel entitled,” and that “I want my credit if I am winning or I am losing,” Defendant Lamar, who is the public face of the Infringing Video and is quick to take credit for it in public statements, has sought to distance himself from any responsibility for the video as an infringement of Plaintiff’s rights.